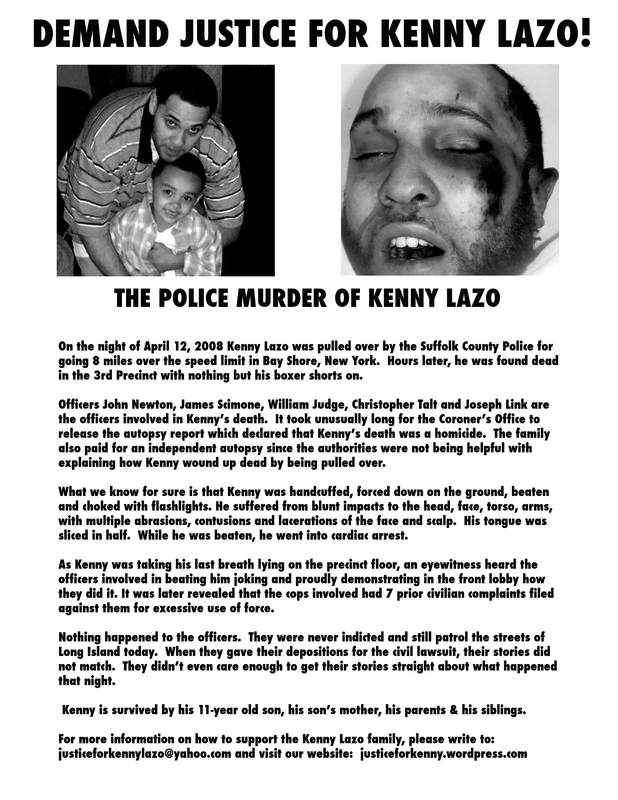 On the night of April 12th, 2008, Kenny Lazo was pulled over by the Suffolk County Police for going 8 miles over the speed limit in Bay Shore, New York. Hours later, he was found dead in the 3rd Precinct with nothing but his boxer shorts on. Officers John Newton, James Scimone, William Judge, Christopher Talt and Joseph Link are the officers involved in Kenny’s death. It took several months for the Coroner’s Office to release the autopsy report which declared that Kenny’s death was a homicide. Unable to get any answers from the police, the Lazo family paid for an independent autopsy which revealed that Kenny was beaten and choked with flashlights while he was handcuffed and faced down on the ground. Kenny suffered from blunt impacts to the head, face, torso, arms and had multiple abrasions, contusions and lacerations on his face and scalp. His tongue was sliced in half. While he was beaten, he went into cardiac arrest. As Kenny was taking his last breath lying on the precinct floor, an eyewitness heard the officers involved in the beating joking and demonstrating in the front lobby how they did it. It was later revealed that the cops involved had 7 prior civilian complaints filed against them for excessive use of force. Nothing happened to the officers. They were never indicted and still patrol the streets of Long Island today. When they gave their depositions for the civil lawsuit, their stories did not match. They didn’t find it necessary to have their stories match while under oath. Kenny is survived by his now 12-year old son, his son’s mother, his parents & his siblings. So After 30 + yrs the racist minded policemen of Suffolk County are still getting away with murder. ..especially in their own Jails..
Death by hanging is a common theme. .